Create extra space, improve your home's thermal efficiency and make it safer. Adding extra space to the front of your home is easier than ever with our range of stunning porches. Each one can be tailored to suit the exact needs of your home, optimising the space you have already. We can ensure you are getting the perfect combination of brick and glass areas with a design tailored just for you. Creating extra space for you, you can use your porch for almost any purpose. Each one is designed with your home in mind, which means it is manufactured to increase the thermal efficiency of your home. Make sure you are making the most of the space you have by installing a porch. Available in a range of colours, you can tailor your porch to suit your home, making sure it blends seamlessly into its surroundings. Choose from a range of colours, finishes and woodgrain effects to find the perfect product for your home. Made with high-quality materials, your porch is guaranteed to make sure your home is safer and more secure. The locking system we use is rigorously tested to make sure you are getting the best value for money. With the addition of a porch at the front of your house, you are gaining a large amount of added space, which means you can use it for any purpose. Whether the expansion is big or small, we are sure we can create the perfect product for your home. We pride ourselves on creating products that our customers can rely on and trust, at an affordable, competitive price. 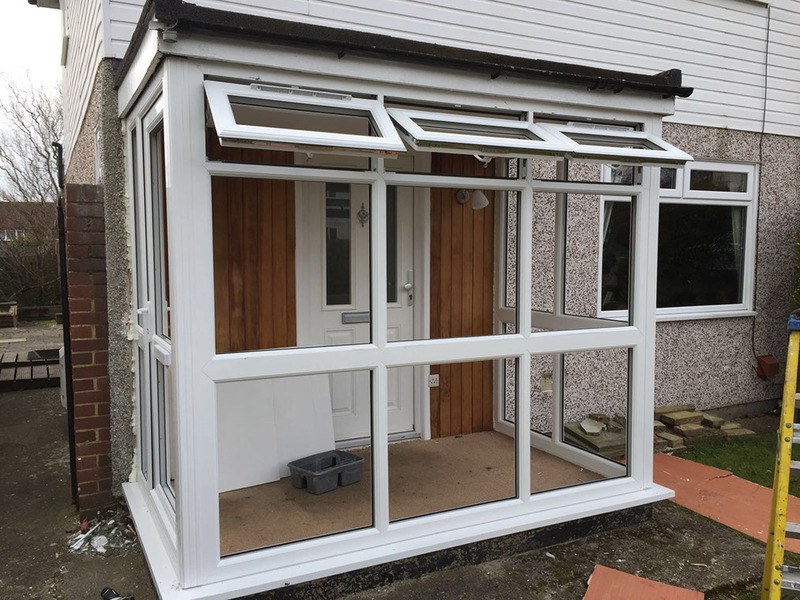 This means the products we offer are all quality checked by a team of highly trained experts, to ensure you are being given a porch that will last for many years. Made from high-quality materials and the latest technology, your home will benefit from an increased amount of space, heightened security and a beautiful aesthetic. Utilising the latest locking systems to come on the market, your home is guaranteed to be more secure than ever. If installed correctly, front porches have the ability to transform homes inside and out, creating more space and a unique welcome for guests. Installed by a team of experts, you can rely on us to ensure you have a quick, easy, hassle-free fitting, that won’t leave you needing to reorder. Using double glazed glass, your home will instantly benefit from increased thermal efficiency by keeping heat inside your home and eliminating the risk of cold spots and draughts. This in turn aids in reducing your energy bills, helping you to save some money. Should you want to sell your home later, you could benefit from installing a front porch. Guaranteed to increase the value of your home, it could make selling your home easier and quicker. A beautiful porch that complements the aesthetics of your home can transform the appearance of your home. Each one uses a unique combination of brick and glass to ensure you are getting the sturdiest frame for your home improvement needs. All our porches are guaranteed to be able to survive any weather condition, without the need to replace it. We understand that no two homes are the same, which is why your front porch shouldn’t be either. Our range of porches can be customised and altered to suit the needs of your home, so no matter how big or small an area you have, we have the perfect front porch for you. If installing a front porch sounds like the perfect option for you, get in touch today and we can talk you through the variety of options available. Our team of highly-trained experts will be on hand to ensure you are completely satisfied before you make your decision. Give us a call on 01737 360 841 and talk to a member of staff today. We will be able to give you a quick quote over the phone. Or, if you are pushed for time, you can use our online form to submit an email to us and a member of our highly-skilled team will get back to you as soon as possible. They will be able to provide you with all the information you need, tailoring it to your specific scenario and answering all your questions. Our team will be able to generate a quick quote at the end. You can also get prices for other products when contacting us about our porches. Don’t forget to ask about our range of doors, windows, conservatories and roofline products when you call, so that we can provide you with a more detailed quote.